Do you think that your bedroom looks quite boring and you would like to redecorate it? Are you confused and do not know what furniture and what colors to choose? If so, then you certainly need some inspiration and the right advice. 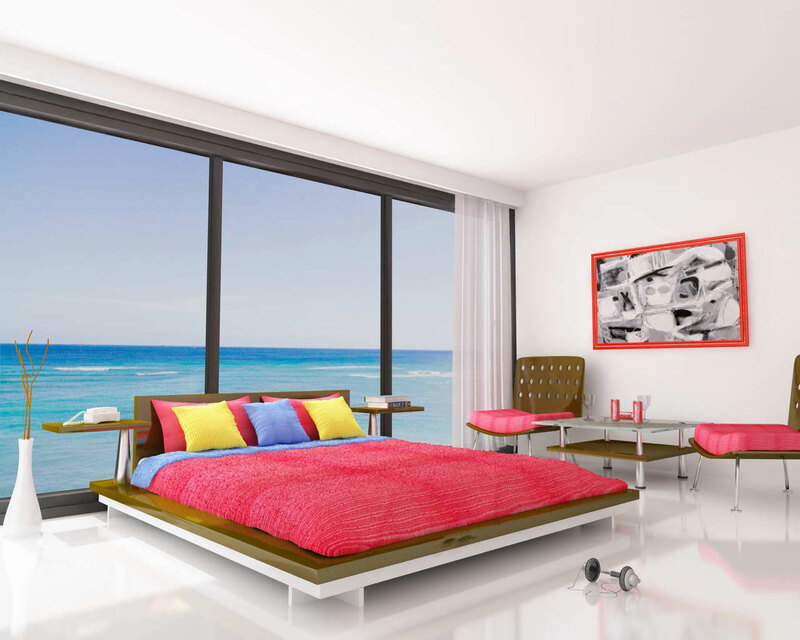 Make yourself comfortable and take a look at the following colorful bedroom designs. When people hear about this combination of colors, they usually think about a room for a very young girl or a teenager. White combined with pink can look absolutely spectacular in a bedroom for adults as well, and you have the best example in the above image. The room looks without a doubt splendid. It doesn’t have too much pink and the white walls and floor make the whole interior look a lot larger and lighter as well, not to talk about the view, which is definitely absolutely incredible. Choose brown pieces of furniture for a splash of color and you will create a colorful yet elegant bedroom. Tranquility is very important, especially in your bedroom, and certain colors will offer it to you, and others will not. It has been scientifically proven that white combined with blue will make you feel relaxed and fall asleep a lot easier. Therefore, bring these wonderful colors in your bedroom as well. In the above image, you can see that the owner has beautifully combined different hues of blue with white, in order to create a nice look. A white bed and some white shelves and drawers will be enough for a room where you just sleep. Do not place too many furniture pieces, otherwise, you will make the whole room look too crowded and ”suffocated”. Some minimalist decorations will be more than enough. A beautiful purple like the one in the above image will definitely relax you. It is a pleasant color which is perfect for a bedroom. Therefore, in case you are planning to redecorate, do not hesitate and go for it. You can either paint a wall in this wonderful color, or you could choose some purple furniture pieces. No matter what you choose to do, make sure that you do not use too much purple. Try to keep a balance between this color and the others you are going to use. However, this is without a doubt one of the most colorful bedroom ideas yet very elegant.